Why creating a recognized brand may be the most important thing you can do for your farm business. How you can create a strong farm brand that attracts customers. What a “brand promise” is and how to cultivate your brand promise. This week is all about branding, something I’ve discussed many times before. But think about it…what is the value of brand recognition to Coca-Cola? To Starbucks, Amazon or Disney? Successful companies ahve long known how becoming a preferred brand translates into price, profit and competitive advantages. You can apply these same principles to your farm business so that customers, retailers and chefs seek YOU out. Big businesses spend a fortune building their brands. But is branding important for your farm business? Today, I’m here to tell you that it absolutely is critical to build your farm brand, and I’ll explain why. So, let’s start with what I mean by the word “brand” because it’s a word that we hear often, but we may not understand the meaning. I mean, what does the word “brand” mean anyway? I’ll start with what I don’t mean. I don’t mean branding your cattle. So we’re not talking about that kind of brand. We’re talking about the marketing kind of brand. Now, sometimes we hear the word brand used in the context of a product name. You know, like Scotch Tape or Dr. Pepper. Dr. Pepper is the recognized brand name. You say you want a Dr. Pepper, but you don’t say the name of the company who makes it. In fact, I bet you don’t even know who makes it do you? You’re thinking Coke. Pepsi. Two other well known brand names. But you’re wrong. Dr. Pepper is owned by Keurig Green Mountain. Yep. Those same guys that make the little single serving coffee pods own your Dr. Pepper. And they own a bunch of other brands you may know, like Hawaiian Punch, Canada Dry, 7 Up, Snapple and a bunch more. So those are a bunch of brand names. And you may not drink those beverages…I know I don’t. But to those who do, those are more than just names. Those names evoke feelings. Why my wife, bless her, craves a coke, she’s craving the experience that she associates with that brand. And that gets to the heart of what a brand is. 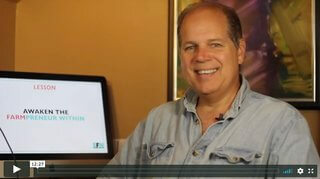 Simply stated, your “brand” is what people think of when they hear your brand name. It’s everything people think they know about your brand offering, whether it be factual, such as 100% grassfed or emotional, such as trying to restore the land. Okay, so why is it so important for you to have a recognized farm brand. Let me tell you with word association. Quick…what search engine do you use. Google, right? Yeah, I know a couple of you are saying, “No smartypants, I use Bing.” Well you can go stand in the corner. Because the answer is Google, and you know it. How about this…what coffee shop should we meet at? Did you think Starbucks? I did, and most would, but even if you thought Dunkies, that’s okay, because that’s a great and recognized brand as well. What brand do you associate with fast food? McDonalds of course. What’s a brand of soda? Coke. Who makes the best smartphone? Apple. Where can I buy…anything? The answer is increasingly Amazon. And where can we take the kids on vacation? Did Disney come to mind? I could go on and on, but the point is this. People can only remember so much. And they tend to associate brands with categories. Don’t believe me? Do you say you want to photocopy something, or Xerox something? You think one name…no more than two, in each category. At least that’s what’s top of mind for you. That’s because…these are the preferred brands in their industries. And that’s exactly what you need to become, because brand preference is HUGE. It’s the difference between you spending countless hours and money chasing customers and you being a category leading magnet that attracts customers. Just think of what that can mean for your farm? it’s the difference between a customer thinking “I’ve got to go buy some chicken” versus “I’ve got to get some of Tim’s chicken” for dinner. Your goal must be to become the preferred brand in your DEFINED market. If you don’t, you’ll be forgotten or overlooked. Notice I said “Defined” market. The question is how will you define the category. Now, if you’re selling locally, your local geography will partly define your market. But, you’re not competing with all FARMS or supermarkets, because people are buying products from you. They’re not buying your farm. They’re buying your raw milk, your organic produce, your pastured meats, your local honey. These products they buy are what consumers will associate you with. And these products, fit neatly into CATEGORIES. So you’re competing in your CATEGORY. And it’s that CATEGORY that you want to dominate. McDonald’s aims to be the brand leader in fast food, not all food, etc. Our sample farm aims to be the leader in pastured raised meats in ______ locale. Or handmade cheese or soap in the state of Texas. So, how do you do that? Try this test. Even if you’re young, you’ve probably heard of Charles Lindbergh. He was the first person to make a successful transatlantic flight, right? So…who was the second person? Any guesses? It was Clarence Chamberlin. What??? Who the heck is that? You see, it doesn’t pay to be #2 in a category. So, if there’s a leader in a category that you ABSOLUTELY can’t get past, what do you do? You create a new category. Here…who was the third person to cross the Atlantic? Now, you’re thinking that if you didn’t know the 2nd you won’t know the third. But you do. That’s because a new category was created. When Amelia Earhart became the first WOMAN to cross the Atlantic. This is why the copycat language I see so often of farm websites is damaging. When a site says it’s non-GMO, beyond Organic, sustainable, heirloom, pastured, blah blah, it sounds like every other small farm website. And that’s not what we want. We want to create categories we can dominate. Here’s another example. Taco Bell fell way behind McDonald’s early on, but that didn’t stop them from becoming synonymous with Mexican Fast Food, thereby OWNING a niche category. And this is something you can do too, whatever your market is. You want to become the BRAND that falls off the lips, that’s top of mind, whenever someone mentions a particular CATEGORY. So now let’s go back full circle to make sure we understand what a brand is. And let’s start with what it’s not. A brand is not simply a logo, a name or your graphics and colors. And it’s definitely not just for big companies either. A brand is something intangible, right? I mean, it’s not a physical asset…it’s a goodwill asset. When you purchase a business you’re buying more than simply the value of the assets. You’re purchasing that good will, which is almost all attributing to your brand reputation. Your brand is basically what people FEEL and REMEMBER about you. So, then what about logo, colors and graphics? Where does that fit into branding? Those elements serve to VISUALLY CONNECT with the feeling the brand conveys. That’s all. When I see anything black and yellow, I immediately think of the Pittsburgh Steelers, my team. Those colors represent their brand, but those colors AREN’T their brand. And when I see those colors together I have the same emotional reaction I have when I see the team’s uniforms. And that emotional reaction is critical in branding, because feelings/rationalization drive purchase decisions way more than logic does! Feelings/rationalization drive purchase decisions, not logic. Otherwise, why spend over $4 for a cup of coffee? Why buy a brand new shirt at a department store when a $2 used one from GoodWill will cover your back just as well. And it’s also why people will go out of their way to buy from a farmer or spend $6/dozen on pastured eggs rather than $2/dozen for cheap industrial eggs. Or spend over $100 for a Thanksgiving heritage turkey when they could get one for free in many grocery stores. And, the emotional connection with the farmer and the values they share is why many people will accept unfamiliar items in their CSA box and learn to prepare them. They’ll to this because emotion trumps logic in almost all purchasing decisions. They’ll buy that new iPhone because of the feeling that Apple gives them. And that feeling customers get from your marketing is called your brand promise. This is what customers EXPECT to experience at all touch points. So, if you decide in advance what you want people to expect, it will drive your actions, website, email and social media communications and design. Then, customers expect to experience that same feeling each time they interact with you OR hear about you. But, listen, there are many things that influence brand perception…it’s not just one thing. So your brand formula boils down to this: it’s who you really are versus how you’re perceived. And you have to manage that perception with the words you craft, the emotional images you share, the change you represent, the stance you take and so on. So you see, building a brand is a critical ingredient in the recipe for sustainable business success. But it’s not only for big businesses. It’s critical for your farm business. 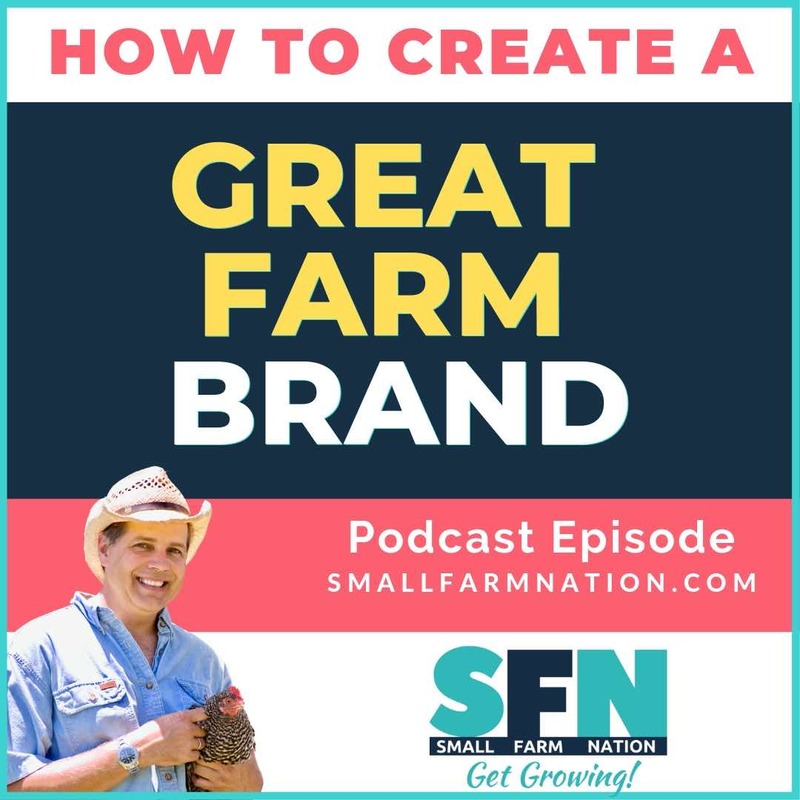 Join the other farmers in the Small Farm Nation Academy and I’ll teach you how to build your farm brand so that you stand out and become THE preferred brand in your market.